Just fyi: I added a link list in the sidebar on the right. So far there is only one link (The Elliott Wave Principle) but I plan to add a few more useful links in the next days. The Elliott Wave Principle (blog post): The main reason why I posted this article is that readers who don't know Elliott Waves get an idea what it's all about. It's just a short summary about its history and its basic rules. 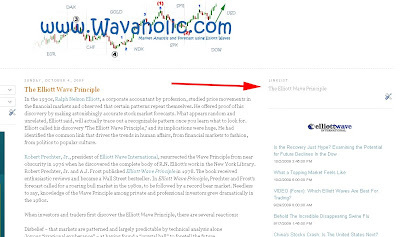 If you wanna know more about Elliott Waves, you can click on Basic Tutorial: 10 lessons on The Elliott Wave Principle at the bottom of the article.